Now while I do have my own amazing recipe for fried donuts, I can’t say the same for baked donuts. I’d never made them before, so I had to find a recipe online. I started with enough dough to make 18 donuts (about three batches). The first batch ended up burning because the recipe I found said to bake them at 425°F for 10 minutes. Needless to say, I didn’t make that mistake again. 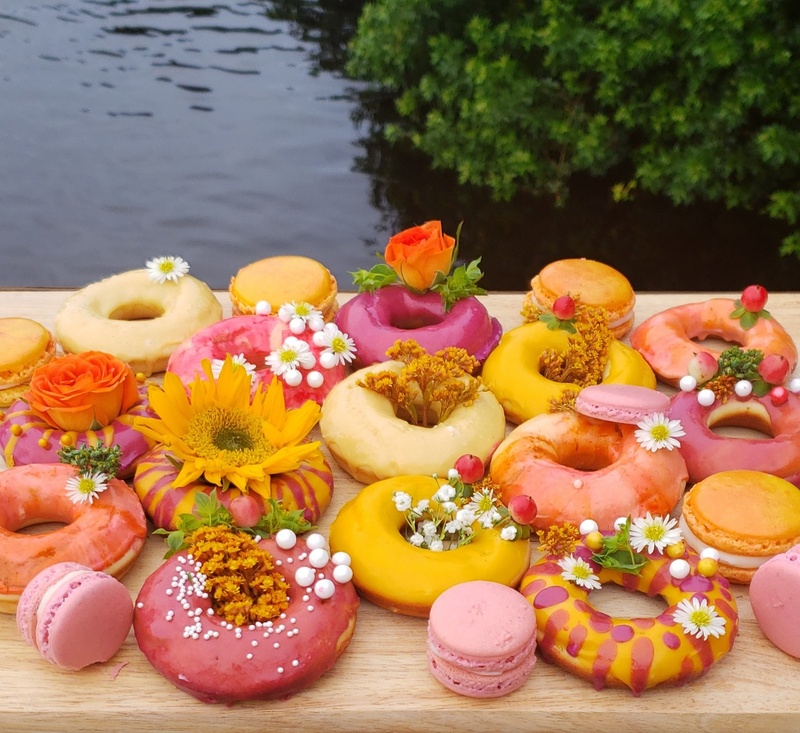 What first inspired me to bake these donuts was a bucket of flowers I bought at Walmart this morning. 🙂 Most people buy flowers to decorate their home, to plant them, water them, and take care of them. Me? 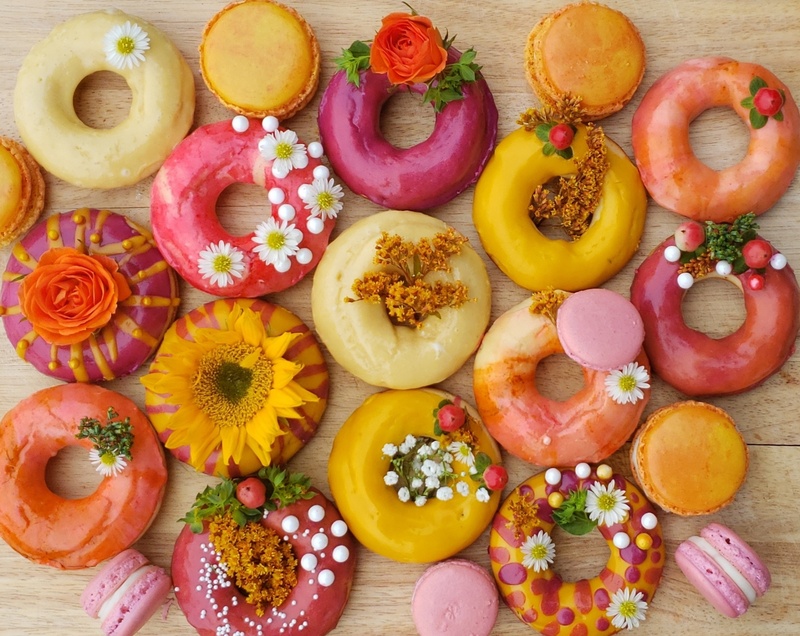 I buy flowers to decorate desserts: cakes, tarts, donuts, you name it. I know, it’s not exactly a normal use for flowers, but they do make my desserts look extra pretty! The real “fun” started during the donut photoshoot. I was all in my element: perfect spot, perfect angle, perfect lighting. Then, as I was taking the pictures, I heard a chewing noise a few meters away. I turned around and there he was: a big raccoon, just standing there staring at me. After a few minutes, he started to approach me, and I got so scared that I climbed the fence! This was no small feat, mind you: there’s a lake with crocodiles on the other side! So there I am, literally laying on the fence, while a raccoon is standing on his hind legs and trying to jump on me! He must have smelled the donuts and wanted a bite. I must admit, although many people have enjoyed my desserts, it was the first time they actually attracted wildlife. I guess the donuts were really that good:D! – Preheat the oven to 400°F. – Mix the butter, oil, and sugar. – Add the eggs, beating well after each addition. – Add the baking powder, baking soda, salt, and vanilla. – Add half of the flour. Mix by hand until combined. – Add milk. Mix until combined, then add the rest of the flour. Mix until everything is incorporated. Don’t overmix. – Put the dough in a pastry bag and fill your donut pan. Feel free to fill each space entirely, but don’t overfill them. – Bake the donuts for 6–7 minutes. – Combine all the ingredients and mix well. – Check the consistency: if it’s too stiff, add more milk; if it’s runny, add more powdered sugar.